Interesting question from a Power Semiconductor customer this week about how to test solder paste for use in Power die-attach applications. The customer wanted to use a wetting balance to measure the solderability of the flux. A schematic of a solder wetting balance is shown on the right: a coupon of known size is dipped in flux and then placed in a holder that grips the coupon at its top. The holder can measure the y-axis force on the coupon. Initially, this force is due only to the weight of the coupon, plus the weight of the flux. 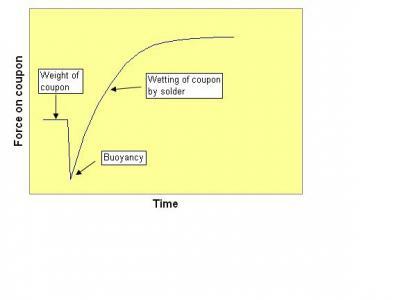 The force changes over time as the coupon is immersed in the liquid solder, initial buoyancy being followed by wetting of the solder to the specimen coupon (see second diagram: solder wetting curve). The solder wetting balance test was originally designed to measure the "activity" (solder wetting ability) of wavesoldering fluxes. In practical use, these types of flux are sprayed onto a large horizontally-held circuit board, so the flux thickness is self-limiting, due to the mechanics of film drainage. 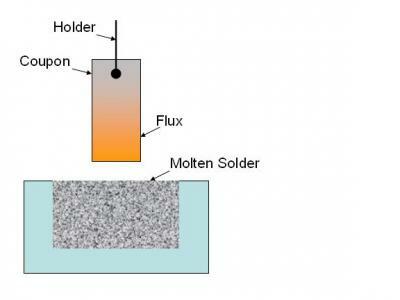 The fluxed board is passed over a "fountain" of molten solder. As you can readily see, the wetting balance tester is a fair simulation of this scenario: however, it can not even begin to approximate the real situation of a reflowing solder paste. 1/ How do you simulate a reflow profile? 2/ How do you simulate the reflow atmosphere (typically forming gas: ~5%H2/N2 at ultralow oxygen levels)? 3/ How do you manufacture a two-sided rectangular specimen that simulates the "real" (die or leadframe) surface? 4/ How much flux (thickness) do you use? 5/ How do you apply the flux? 6/ How do you account for the amount of activator used up in reflowing the solder paste? 7/ Can you correlate the data to voiding results? 8/ If you use a die as the test specimen – how do you account for the non-wetting bare silicon on the edges, which (if left unpassivated) may have a small level of solderability? 9/ How do you account for the lot-lot variability of real die and leadframes? 10/ Even if you get a fast/good wetting result for your leadframe: is that truly desirable? If your entire leadframe becomes wetted with solder, then controlling the bondline thickness and controlling die-skew and die-tilt become seriously problematical. The best way to test solder paste for die-attach application is in the process itself. Don't waste your time on lab simulations, then attempt to correlate those datasets to real life performance. More on testing die-attach solder paste next time.